Our beautiful collection of high-peak white tents and our huge selection of tables and chairs will surely meet the needs of your event. Don't settle for shabby older equipment that will ruin the quality of your party – choose the best! This table set has endless possibilities including cocktail service, buffet line, coffee bar, registration table and more! 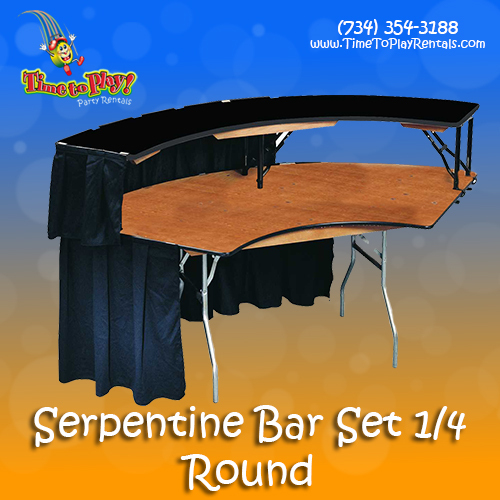 Like our standard round and banquet tables, our 2-tier Serpentine Table is constructed with wood tops, sealed with stain and polyurethane, and edged with aluminum. With an attractive contour design, this table conveys elegance and sophistication. Beautiful black specialty linens are included with your rental.